Yesterday, I had an svMotion that crashed as the vCenter server (vSphere 5.0 u1) was rebooted while the svMotion task was in progress. 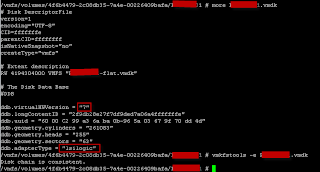 Afterwards, a copy of the VM named "servername (2)" had been created in vCenter and a number of empty vmdk files were created at the destination LUNs. There were a file lock on these files so they could not be deleted. and I wasn't able to vMotion, snapshot or continue the svMotion on the source VM. I tried moving just one of the vmdks with svMotion which resulted in the VM crashing and after that it wouldn't power back on. The error states that it cannot find one of the vmdk's. I looked in the relevant folder and discovered that the vmdk descriptor file was missing, the folder only contained the vmdk-flat file (the data file). I found a KB from VMware on how to recreate this descriptor file. And it worked fine. Identify scsi controller type, lsilogic in this case. Edit the vmdk descriptor file with the vi text editor. 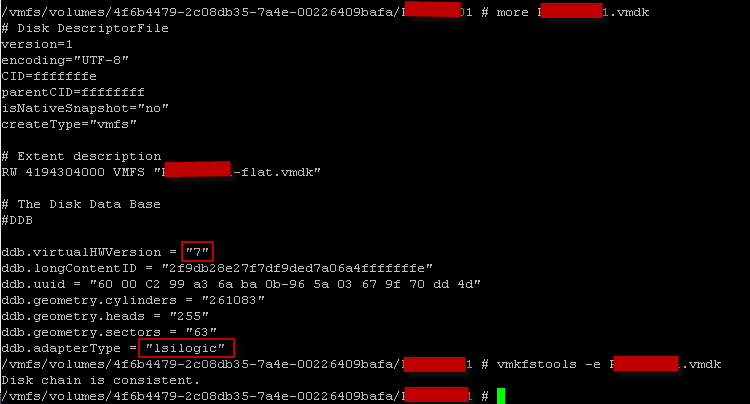 This included the vmdk flat file name, the vHW version, and deleting the line about thin provisioning.